In today’s demanding digital era where large amount of data, processes and business interactions need to be continually analyzed, processed and acted upon, business users and IT departments are excessively overwhelmed with workload that cannot be matched by existing solutions and methodologies. Today’s systems place heavy requirements on specialty skillset to keep the lights on for the business resulting in talent resource management and cost issues. As a result, organizations today generally do not perform well when it comes to change as existing solutions and systems are not designed for rapid alignment to business changes. Furthermore, many companies have globalization plans when it comes to business operations. This place huge challenges for organizations not only to design and build solutions for internal market but also to rapidly customize and align with business operations overseas when needed. These requirements depending on cultural differences are different in processes. Service qualities, security and governance of operations are becoming difficult with users rapidly adopting smartphone, social networks and many other multimedia communication channels. Many companies have plans for mobile business strategies but find it hard to execute both in terms of cost and solution. Today’s mobility means more than catering to a particular model or device type. The rate of new devices coming out to the market is becoming rapid. Ubiquitous access and context-aware assisted business service is a must. On time performance and quality service requires a full end to end review and monitoring of business services spanning multiple systems, silos and operations. Compounded to the issues are multiple projects initiated that place heavy burden on executives to monitor budget, cost and impact to the businesses. Today’s systems are just too complex. Beside not meeting expectation, users have no control over their processes and will not be able to change fast enough to shape their business operations and services competitively both in terms of cost and time. The world today requires business to rapidly align with customers and to try out new business strategies as fast as possible. Companies are now required to think hard in area of how to sustain leadership in the market which means constant adaptation and continuous quick improvement to their processes where needed. All such challenges mentioned above have prompted analysts like Gartner in 2011 to remind users to start “Re-Imagine IT”. IT departments are now required to spend more time innovating new IT-based business revenues with business users. Current approach that locks as much as 70% of time and resources in “keeping the lights on” activities must change. Innovative and radically new approaches are needed. While many current advices are in areas of infrastructure reforms like “virtualization and cloud”, we believe that a total solution that rethinks from the ground up, taking care of people, infrastructure, processes and mobility is needed. Galaxy Business Operating System is specially born out of these needs. Galaxy Business Operating System (BOS) is a revolutionary enterprise business service platform that is born out of GrowHill decades of extensive infocommunication expertise and experience. We have strategically engineered the solution with many patented technologies spanning the database, network, business process, web and mobile devices and touch-points technologies to offer businesses an integrated state-of-the-art info-communications platform. Galaxy BOS supports the new world of business needs, functions and services in a new strategic way. We say, businesses and IT can now simply focus on innovation and execution of business strategies everyday. Because of GrowHill unique strength and focus in empowering telecommunication technology and solution infrastructure, customer experience management, hardware and software expertise, GrowHill span of over many patented technologies, iSense, iConnect, Live-iCell, Nanotechnology and many others have come together to forge a Galaxy Business Operating System to uniquely cater to the current business landscape that demands quick alignment of technology to boost business competitiveness, to create, differentiate and extend new business opportunities all without present day complexity and cost structures. Executives desire to connect process goals directly to strategic objectives. Management wants better support for decision-making that drives operational targets and the ability to add rules to processes that ensure compliance to principles and regulation. Process owners want to see their process goals and related handover criteria represented. They want to manage change requests by business users and be able to define hand-off boundary rules for processes. Business professionals want to go mobile and have the flexibility to pick and choose from alternative goal-oriented activities and modify and add work items where allowed. Galaxy BOS fulfills all these requirements in a single platform to empower users at all levels to do their tasks while continuously align with operational goals and business results. Liquid-designed development and configuration tool enables rapid creation of comprehensive business functionalities to meet any unique business workflow, user interface and business service requirements. Galaxy arsenal of features like real-time, free-flow design of e-forms and flexible multi-level case and process workflows enables true business operations to be quickly automated, tested, and continually refined and configured all in a single environment and platform. Real-time dashboards and online management of comprehensive 360 end-to-end service levels to clients and real-time alerts using ubiquitous multi-channel and multi-device escalation ensures every case is monitored promptly and processed within the agreed service level. Processes are continually aligned so that nothing falls through the cracks. Patented Live-iCell technology ensures service levels and can scale to millions of alerts without slowing down the server. All transactions and attached documents are compressed, encrypted and recorded electronically to conform to global best practices for audit trails, transparency, security and ease of access to meet the most stringent compliance regulatory framework. Devices have no data residing on the user end and database records are securely encrypted. Data in transit or at rest is encrypted giving organizations a peace of mind when dealing with both internal and external parties. Any authorized client or staff can track the progress of their cases and applications through the convenient multimedia notification feature to provide hassle-free updates and unmatched convenience across different channels to manage status enquiries. Patented Live-iCell technology powers millions of notification without any delays. Galaxy provides a continual process improvement platform where processes can be continually adapted by the users similar to ITIL V3 and agile methodologies where they advocate continual service improvement strategies. Galaxy layers on existing system via service-oriented architecture to give a continual process improvement lifecycle approach to users. Users are no longer plagued with the complexity and cost of event-driven middleware and services. Users simply focus on the processes they own, improving them by the days rather than months, thereby helping businesses differentiate their offerings even faster. Galaxy business operating system fully supports organizations to practice lean six sigma processes, ITIL V2/3, COBIT 4/5 and many ISO standards from day 1 of operation and will help organizations rapidly matures to a new level quickly. The ability to respond quickly and cost-effectively to changes in requirements is achieved using the user-friendly, rapid-development toolkit packaged with the system. Galaxy is an agile-enabled change management platform where any future change requirements can be effectively executed with ease. Galaxy can handle easily more than 1000% increase in change requests currently handled by existing IT platform. In order for organization to scale and continuously renew their corporate processes, empowering business users and delegating authority where business areas permit is key to business competitive advantage. Galaxy allows organizations to effectively delegate as much as 70% of change management activities to the business users in the cloud where appropriate security and roles are assigned, freeing IT to align with business users on innovative services rather than keeping the lights on activities. Galaxy flips the ratio now. Galaxy patented Nanotechnology on information database access layer enables users to dynamically and continually map their customers, dealers, vendors or users relationship information into meaningful portal information pane for their operations. Informations can be dynamically updated, expanded or deleted as and when needed. Historical interactions and data pertaining to the relationships are tracked end to end empowering users to understand full relationship, past transactions and harnessing them to an unprecedented level for the business competitiveness. All management and statistical reports are available in real-time and can be viewed online through any devices. Galaxy incorporates rich visual-analytics in the management dashboard for actionable insights into case issues and business activity patterns. Summary reports can be requested and delivered via email, SMS or MMS, anytime, anywhere through mobile devices. Galaxy embraces the highest standard of SOA. Open-standards interfaces using XML web-services, Message Queue (MQ), Biztalk, Host Integration Server, ODBC, TCP/UDP Socket Communication, allow seamless integration with any in-house application, database and back-end IT infrastructure. Organizations have the option of using Galaxy’s ready-made databases or leveraging on their existing customer, supplier, or staff database, for seamless integration. Galaxy patented iConnect messaging system is carrier-grade and extremely high in performance. We understand that highly-skilled workers are influential in contribution. However, to have all workers in organization trained to the level of knowledge workers productivity is difficult. Galaxy empowers that level of productivity through patented technology known as Launchpad, where information and guidelines are delivered real-time to users at the right time, at the right screen, at the right devices and to the right person, to make users perform at an unprecedented level of productivity. CRM, IVR, Multimedia Contact Center enabled Galaxy empowers a 360 degree understanding of customers at micro-second interval. All users simply perform with Galaxy. Galaxy provides the smooth linkages between all business operational tasks, be it human, machine or process. The platform provides many key benefits in areas of business intelligence including triggering actions, processes and alerts with accordance to business operational KPIs and metrics. The real-time information flowing in Galaxy business operating system enables executives, managers and staffs to take real-time actions where needed and to tune and set real-time optimization and goals to these actionable business operations. 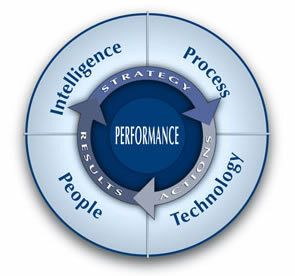 Companies have been able to achieve amazing results using such actionable business intelligence. Business intelligence just rises from the back office to the entire real-time platform in Galaxy. Organizations that have a focus on mobile strategies engaging staffs, customers, partners and vendors can leverage Galaxy platform to have a hassle-free mobility services without any work at their devices. Mobile users do not have to install any plugins to login and access the information. Galaxy automatically recognize the device and render information accordingly to the device with our patented device rendering technology. Organizations can re-imagine and realize innovative new possibilities of servicing and working with their stakeholders through Galaxy platform instantly through all devices (WAP, Browsers, Ipod, Ipad2, Android, Blackberries etc.. Users are no longer constrained to a particular type of devices. Mobility simply work on Galaxy BOS. Organizations no longer have to worry about keeping up with new mobile technologies. Social networks such as Facebook, Linkedin, Google+ and many others are attracting tremendous pool of users, customers, and corporate staffs. Enterprises are currently interested in listening and responding to customer opinions, remarks and requests on these social networks. Galaxy provides a social CRM platform where such events are monitored in real-time and alerts, escalations and responses to important events in these social channels are tracked and handled consistently on the Galaxy business operating system. As more and more users are turning to social networks to post requests, enterprises and governments are forced to react but most often than not are not able to cope with such tsunami of requests. Galaxy platform provides an automated skill-based routing features where these requests can be serviced with the right people, processes and channels, thereby giving a total customer experience platform through these social channels. Galaxy platform scales extremely well with just normal server, leveraging its patented Nanotechnology and iSense core that can alert, detect and act on events like temperature of server room, uptime of UPS, CPU usage etc. Galaxy self-aware platform has extremely high concurrency in serving requests. The core system is specially designed to handle extreme load without failing due to resource (memory, CPU etc.) constraints. GrowHill patented DSP acceleration technology can take the software and hardware to a new level of performance and scalability. Galaxy business operating system is a solution that is completely designed from the ground up to be fail-safe and to support mission critical services. Many businesses today cannot tolerate loss of data, service and system downtime. As such, a system that provides 99.999% mission critical services that is cloud ready (hosted, private, public, hybridge all available) and consistently reliable is important. Galaxy is made to be the highest performing and fastest business solutions in areas of supporting extreme number of concurrent users and business transactions. Businesses requiring to support large number of users, business transactions will find Galaxy BOS extremely appealing due to its high performance and much lower TCO. Galaxy business operating system core is designed specifically for high volume and extremely fast response (micro-second level) time. In the confidential, private and mission critical world of healthcare, Patient Information can be retrieved, stored and accessed accurately, securely and quickly retrieved in confidence by each patient or doctor. Through Galaxy , we will enable you to provide personal concierge services to your patients and professional services to your doctors and major corporate customers. In the fast changing world of retail, retailers can lead the market by coming out if innovative sales campaign within very short intervals that makes it impossible for their competitors to catch up. Retail customers on our platform will be able to enjoy different route of purchasing experience through internet, mobility, social networks, behavior based buying etc. There is no limit to use your creative to sell more. 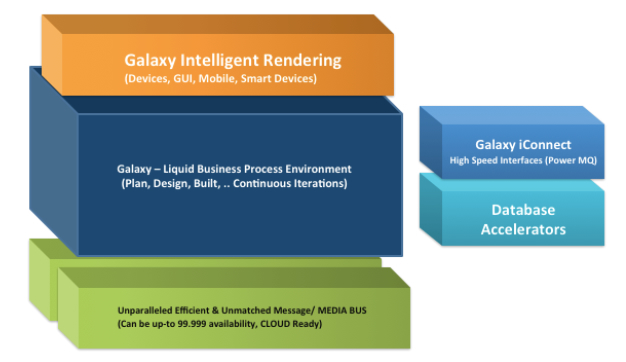 Galaxy Business Operating System is NOW available ! IS YOUR BUSINESS REAL AGAIN?